Social Media in the Professions - Is there an APPetite for the digital revolution? I'm pleased to announce that I have accepted an invitation to serve as chair of the upcoming PSMG annual conference to be held in London on 14 November 2012. This year's theme is "Social Media in the Professions - Is there an APPetite for the digital revolution?" There are numerous substantive and informative sessions in the plans, as well as a compelling keynote presentation by Clare Adshead-Grant, managing partner of Calista, one of the leading digital marketing and business development consultancies in the professional services sector. The Professional Services Marketing Group is for those with an interest in marketing within professional services organizations, including practitioners, recognized consultants, suppliers and those who have an interest in this sector. PSMG is a UK-based organisation with active groups in key commercial centers in the UK and international links in North America, Canada, Europe, Australasia and the Middle East. Its members come from various professions, including law, accountancy, real estate, banking, architecture, actuarial, insurance, management consultancy, marketing communications, engineering and construction as well as those with an interest in professional services marketing. Book your tickets now and join me in London in November! Many organizations invest valuable resources pursuing the wrong targets, and waste time and energy nurturing the wrong clients. This is a variation on the oft-repeated and oft-wrong maxim that "all revenue is good revenue." In fact, even in recessionary times when top line revenue is hard to find, it pays to pursue the right targets and nurture the right clients. But who are they? How can one distinguish the poor targets from the rich targets? Many years ago as I was beginning my sales career, I struggled with time management. More specifically, I didn't have enough time in my day to pay equal attention to all of my clients and prospects, and without a system to prioritize my time it seemed I was always in the wrong place at the wrong time. This was compounded by the fact that I couldn't easily recall which client had already purchased or rejected our many products, so I wasted a lot of time re-selling. A helpful sales manager explained to me the concept of a "white space" analysis. In short, she explained, list your clients on one axis and your products on the other axis to create a simple grid. Where a client has already purchased (or rejected) a product, put an "X" in the intersecting box. Do this for all clients and all products. The open boxes, the "white space," reflect your opportunity focus. Preparing a white space analysis is a simple but effective tool to allocate your limited time and energy to those opportunities that matter. When I conduct law firm business development workshops, if there isn't a white space analysis in place already (and there typically isn't) then we prepare one. And many organizations stop there. But savvy marketers know this isn't enough, not nearly enough, to truly identify the appropriate targets. The greatest challenge with the white space analysis is its lack of context. Sure, Client 4 lacks Products A and D, but this says nothing about whether or not Client 4 needs them. The car salesperson who exerts a lot of energy trying to sell the off-road package to the 75-year old grandmother purchasing an SUV may not generate a good return on his investment of time. The law firm trying to cross-sell its IP practice to its mutual fund clients may find a less than receptive audience. The legal vendor trying to sell complex litigation case management tools to a law firm engaged primarily in estate planning may end up buying a lot of free lunches for uninterested buyers. Similarly, no organization should promote every product equally. Some generate higher profits, some create long-term switching costs, some products are new and need traction whereas others are fading in prominence. Many law firms, in part because of a lack of marketing sophistication and in part due to politics, will pay lip service to providing marketing and business development support equally across all practices and partners. This is folly. Why invest equal time and energy promoting the practice that has the greatest price pressure, the one in which clients are fleeing to the low-cost providers, while another more lucrative and in-demand practice struggles to stay on top of its RFP responses or to manage its networking functions? The more advanced approach is to incorporate internal and external data points to generate a more robust footprint of the ideal target or client. In most organizations, a great deal of attention is directed toward the highest-revenue producing clients. But a large purchase could vault a client onto this list in a given year, while next year it fades back into oblivion. A better metric is lifetime value. In a law firm this may be the client that generates above-average fees for 5 or more years, ideally across multiple practices. For targeting purposes, perhaps the company within a specific SIC code in which the firm has unique expertise, that has a geographic footprint similar to the law firm's, and with needs spanning several practice areas, is a more appealing prospect than the Fortune 50 or FTSE 100 corporation which just happens to have a large facility nearby. The incorporation of these other data points is what I call a "green space" analysis. We start with the white space grid and then we continue to narrow our focus. Of the clients and targets identified, which best fit the model of the ideal client? Furthermore, which of these clients are in growth industries and are on a solid financial footing? Internally, which practices generate -- at the moment -- a proportionally greater return than the others? Which practices have a true competitive advantage (something more definable than "our lawyers are better")? Which practices have the bench strength to mobilize quickly if our efforts generate new leads? The data points one selects will vary by firm. And they'll vary from year to year. The "ideal" client is a moving target, of course, but it's far more beneficial to pursue ideal clients and targets than to assume the highest revenue producing clients from last year, or the biggest companies in town with whom we don't already have a working relationship, are the best opportunities for us. Several vendors provide assistance in defining the ideal client. I've been successful in incorporating Dun & Bradstreet information into a firm's targeting efforts. The D&B data points such as SIC codes, geography, size, as well as their comprehensive corporate tree information, can provide some interesting insights when coupled with a firm's own client data, e.g., from its time & billing or customer relationship (CRM) databases. Thomson Elite, the leading time & billing enterprise suite for large law firms, offers similar capabilities. I've long been a fan of Redwood Analytics, now a LexisNexis company, which provides deep marketing and operational insights for financial and matter management. I recently had the occasion to review a new "client profiler" tool which combines data from Redwood, LexisNexis, Martindale-Hubbell and AtVantage -- all products in the LexisNexis client development suite -- to offer up much of what I describe above in the green space analysis. The tools one uses are immaterial if the underlying concepts are forgotten. In fact, I submit that the first attempt at establishing a green space analysis should start with a flip chart or whiteboard, and the opening exercise is establishing which internal and external drivers we value most. Long-term retention or short-term growth? Enjoyment and intellectual challenge or less exciting but repeatable work? Big clients with many needs or small clients with limited needs? Complex businesses with ongoing needs and significant negotiating leverage or businesses with isolated, one-time but substantial and potentially price-insensitive needs? And so on. Once we establish the parameters, we now know the queries to enter into our existing systems, or at least we'll have an understanding of the types of tools we need to acquire to conduct this analysis. When farming your internal and external data to narrow your focus, there's no perfect planting or harvesting season, though it makes sense to start early in the year when budgets are available to deploy against the greatest opportunities we identify. But don't wait too long, because every day you wait another X is added to the grid by your competition. Periodically I take stock of my web 2.0 efforts, to ensure that I continue to derive value from the tools that matter and discard the rest. Here's my latest appraisal: Blog - I've moved my professional commentary to this blog from my personal blog, which now allows me to maintain two personas. Frankly, I don't mind mixing business with pleasure, as it were, and many of my readers have mentioned that an occasional family photo or recap of my basketball league provides insights into my personality that might not otherwie shine through. Nevertheless, I made the split and it's working out well. LinkedIn - I continue to maintain a robust profile, inviting or accepting invites from those I meet in business settings. I have instant recall of perhaps 80% of my 463 contacts. For the remainder I have to consult my notes to recall who they are. It would be very helpful if LinkedIn allowed personalized annotation of the contact record itself. Recently I've received several "Please introduce me to someone you know" and "Please introduce me to someone who knows someone I want to meet." All but one request has come from a trusted source so I have happily complied. I've met several job seekers who have indicated a desire to troll my contacts and ask for introductions, but not a single one has followed through. Apparently cold calling still gives one pause, no matter what the form. Facebook - I've spent significantly less time here since the recent upgrade which, to me at least, made it more difficult to navigate. But I still drop in a few times a week. This is mostly reserved for family, close friends, old friends getting back in touch and the occasional business connection, now totaling 230. I really wish FB allowed categorization of friends so I could accept invites from distant acquaintances but limit their access to my personal content. Twitter - I'm a regular tweeter and reader, and careful readers will note the Twitter feed in the right column of this blog. Twitter leads me to some of the most compelling articles, of both professional and personal interest, that I might not otherwise see. It's also increased my visibility and allowed me to find others with like interests. I will regularly tweet from conferences and speeches I attend, and eagerly read others' recaps of conferences I cannot attend. I tend to amuse myself by posting personal updates alongside professional commentary, a habit which many disavow. But as with my blog I tend to believe that injecting some of my personality makes things interesting. Somehow I have attracted 364 followers, and I follow 233. Twitter Grader ranks me 96.7 out of 100, though I'm still waiting for my gold star! Google Reader - I monitor a large number of legal and news sources daily in Google's RSS reader. This can become overwhelming, but I find it necessary to stay on top of what other thought leaders are saying and what trends are influencing our marketplace. At the end of this post is a partial list of the professional sources I rely on. I'm a voracious reader but years ago I found that I couldn't keep up with all the books I purchased until I overcame my reluctance to start a book unless I had time to finish it. I also redefined "finished" to mean when I lost interest and not when I reached the end. With that burden off my shoulders, I now read books and magazines and skim hundreds of articles and blog posts daily without the obsession of reading every word. It's faster that way! Legal OnRamp - This legal community has been around a couple years now and I'm starting to spend more time there. As an alum of Counsel Connect, the early 90's online legal community launched by American Lawyer, I enjoy re-connecting with the brilliant minds discussing the fundamental changes taking place in the legal marketplace. Whether it's a debate on the billable hour, the use of technology to automate routine tasks to lower costs for clients, substantive legal issues such as the American Law Institute's (ALI) proposed changes to the law for software contracts -- the point is savvy outside lawyers have an opportunity to demonstrate expertise to a captive audience of in-house counsel. LMA Connect and the Lawmarketing listserve are two networks where I monitor and contribute commentary to the legal marketing community. There is overlapping membership but often robust discussions. Many law firm leaders might be surprised at the level of business expertise already residing within their firms today. Classmates.com - I maintain a profile here, which is helpful solely to reconnect with school chums. However my profile points visitors to Facebook and LinkedIn. Martindale Connected - I am an alum of Martindale and, quite evidently, a regular user of web 2.0 tools, but I have not been allowed to join so I have no opinion. ABA's Legally Minded - I joined this community but can't find a reason to participate. Plaxo, Naymz and Spoke - All are similar to LinkedIn, but other than accepting requests from others to connect I don't visit. MySpace - My profile still exists but not even my young nieces visit any more. It's all about Facebook. LawBeat - Veteran legal journalist turned academic, Mark Obbie "watches the journalists who watch the law"
The last time I posted my reading list I received several excellent suggestions. So please, tell me what you read that you find interesting and helpful for staying on top of the changing business of law. Some years ago when I led a company that was a prominent vendor and sponsor to the legal marketing community, I would regularly take the LMA to task for its tone-deaf and heavy-handed approach to vendors. They listened and today the association, and the legal marketing community, are far more receptive and embrace the involvement of legal vendors and suppliers. Don't get me started on other legal associations which appear to regard vendors as evildoers whose role is to send money and logos in return for some token table scraps. So other than one comment, this post does not address the effectiveness of the LMA annual conference from the vendor perspective. Rather, I will comment on vendor participation at the conference... what worked, and what didn't. First, the one comment directed to LMA: The hotel was a beautiful venue and well-suited for a business conference. However, the exhibit hall must be closer to the educational session rooms. No ifs, ands or buts about it. Periodically a conference planning team will underestimate the importance of this single fact. That's a mistake. Since I'm confident every vendor made this point in their post-conference evaluations, I won't belabor it here. I presented on the topic of managing legal directories, lists and rankings along with Nicole Carrubba of Captivate Legal Marketing. Though we both have considerable expertise in this area, we spent some prep time on the phone interviewing directory publishers and consultants who specialize in this space. The publishers, without exception, in some way incorporated the following three assumptions in their remarks: everyone hates us; the competitors stink; and our offering is defined by what the competitors are not. There are certainly some legal marketers who don't like the very notion of directories, rankings and lists, believing them all to be part of some scam based on lawyer vanity. 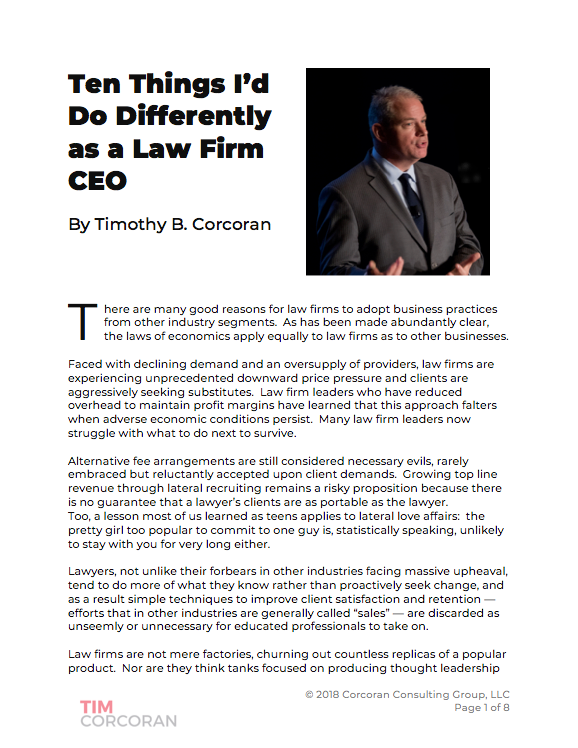 But there are many who view these tools as standard components of a law firm's marketing mix, plus there is a constant influx of new marketers from outside the legal profession who have no pre-formed bias. My recommendation, lose the chip on your shoulder. In every business there are competitors. There are often head-to-head fight-to-the-last-bullet battles between competitors. And it's important to know the competition. But my view has always mirrored legendary UCLA basketball coach John Wooden's (possibly apocryphal) view on game preparation. He never reviewed film of his opponents, and instead focused his team on flawless execution of the basics. In other words, it doesn't matter what the other guy is doing; all that matters is that we execute well. In business, deliver what you promise, deliver what the client needs, and let the other guy worry about what you're doing. In a similar fashion, find your own unique selling proposition. Help the legal marketers answer the question, Why is your offering additive to my marketing mix? It's not effective to use "We're better than the other guy because we don't do X or Y, we do Z." This assumes I have superior knowledge of the other guy, which immediately diminishes your offering. What do you do well? Figure out how to say it. Interestingly, as I walked the exhibit floor talking to multiple vendors, this theme reappeared several more times. In one notable case, the president of a small technology company was barely able to articulate what his offering delivered. He hemmed and hawed waiting for the top sales guy to finish up with another prospect, and while he was waiting he described his product thusly: "We're sort of a Product N light. We don't do all that they do, but then most people don't need all that anyway." Product N, in case you hadn't guessed, is a leading product in the category. My advice (well, beyond "Don't stand in the booth if you have nothing helpful to add") once again is to define your unique selling proposition in a few words. Surely you must offer something that doesn't require me to know all about the competition first! At one point I worked the exhibit hall during one of the educational sessions. I suspect I'm not the only conference attendee who occasionally finds nothing of interest at the offered sessions, or perhaps just wants to talk to vendors without the crowd that amasses during breaks. However, the booths were mostly empty. Obviously I wasn't able to poke my head into every educational session, but since many vendors had exhibit-only passes, I surmised that they weren't attending a session and they weren't in the booth. Where were they? I can only hope that they were busy in a demo room or were holding some other private client discussions. If they were at the hotel but not in the booth when prospects were there, that is a travesty. Nevertheless, I enjoyed the 15-minute chair massage in the information vendor's booth while no one was around. The opposite is also true. In some booths the vendor representatives repelled visitors through one of two techniques: either they stood in a semi-circle in the front of the booth facing in while talking amongst themselves, making an approach impossible; or they stood in a semi-circle facing outward, making an approach daunting as 4 or 5 sets of eyes stared at every passer-by. Some sat quietly working on their laptops undoubtedly attending to important client matters while we walked by, glanced at the literature, possibly picked up a giveaway pen, and moved on, never making eye contact. A few, of course, made visitors feel welcome. I won't go into detail here how to make that happen because it's more amusing to point out what doesn't work -- and besides, helping vendors better reach clients is part of what I do for a living! Actually, I will reveal the greatest secret to increasing your ROI at a conference, particularly a close-knit community like the legal marketers. It's this: Be part of the community. It's that simple. How? Buy more than exhibit-only badges and spend more time with the clients and prospects, learning alongside them in educational sessions, spreading out and mingling with them at breakfast, lunches and cocktail receptions, and attending all the after-hours events. My former sales teams knew, enjoyed and heartily participated in this credo of non-stop client interaction. We reached a point where our conference booth was the least important place for us to interact with clients. We didn't even post a schedule. We knew that during the conference, from roughly 7 AM to midnight every day, we were with our clients -- our friends! -- participating and contributing alongside them. When the exhibit hall was open, we'd all be around, though we wouldn't congregate in the booth and scare visitors away. And we most certainly, and enthusiastically, joined our clients after-hours. And we didn't always pick up the tab either. Because we were members, not vendors. At one point at the LMA's "gala" event, amidst all the dancing and frivolity, I stepped outside to get some air and to drop in to a bar next door to the conference hotel to have a drink with an old colleague. There, arrayed in a group of 15 or so, was one vendor team. There wasn't a client in sight, for they were all enjoying themselves back at the conference hotel. Just the vendors enjoying themselves, by themselves. This is poignant example of what to do as a vendor to the community, rather than as a member of the community. I'll wager a tall, cold drink at the next conference that the ROI report delivered to this vendor's management team was that the conference was good, but not great. Legal vendors: what sort of sales team preparation do you undertake before attending a major industry conference? Does the team memorize clear and concise elevator scripts, unique selling propositions and positioning statements? Do they know their responsibility at the conference is not equal to their assigned booth times? Does management in attendance know what to say, or when to be quiet? Do they know when to join clients, and when to take the team offsite for well-deserved R&R? This isn't rocket science. Good products, even great products, don't sell themselves. It takes work and practice to move along the continuum from vendor to the client community to member of the client community. Are you there yet? What are you waiting for?